Who doesn’t love pizza? Living in Chicago, I’m surrounded by lots of delicious pizza: Giordano’s, Lou Malnati’s, Chicago’s Pizza, and more. I love pizza, but I rarely, if ever, actually eat or order pizza because of the calories and fat. When I’m craving pizza, this is what I make to satisfy my craving. This gives me all the flavors and tastes of pizza, but is much lower-calorie and lower fat than regular, restaurant style pizza. Not to mention it is super easy! I use store-bought Greek flatbread as the crust (Oasis brand is a good one) and just add my toppings! Feel free to spice it up the way you like and add any ingredient that you want. Below are a few ideas for you. Ingredients: 1 store bought Greek flatbread, 2 tbsp pizza sauce, 1 oz reduced-fat shredded mozzarella, 1 tbsp grated parmesean, 10 slices Hormel turkey pepperoni, dash of red pepper flakes. Spread the pizza sauce on the flatbread evenly and sprinkle a dash of hot red pepper flakes. 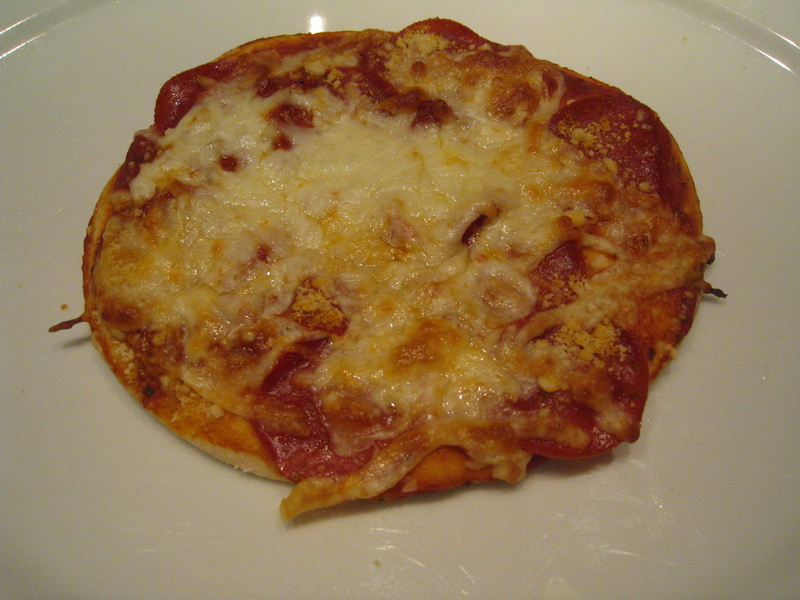 Place turkey pepperoni onto the flatbread and then sprinkle on the mozzarella and parmesean. Place in a 400 degree oven for 10-15 minutes or until cheese is melted and has a toasted color. Ingredients: 1 store bought Greek flatbread, 2 tbsp fat-free wing sauce, 1 oz reduced fat shredded mozzarella, 1 tbsp grated parmesean, 1/8 cup diced celery, 1/8 cup diced grilled chicken. Spread the wing sauce onto the flatbread evenly. 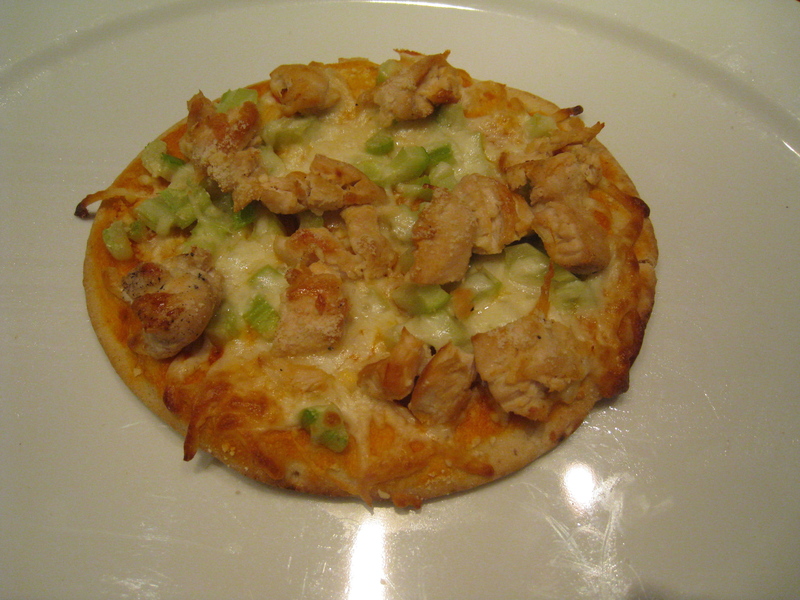 Place chicken and celery onto the flatbread and sprinkle mozzarella and parmesean on top. Place in a 400 degree oven for 10-15 minutes or until cheese is melted and has a toasted color. Ingredients: 1 store bought Greek flatbread, 1 tbsp grated parmesean, 1 oz reduced fat shredded mozzarella, 1 small plum tomato (sliced), dash of dry ranch mix, dash of garlic salt. 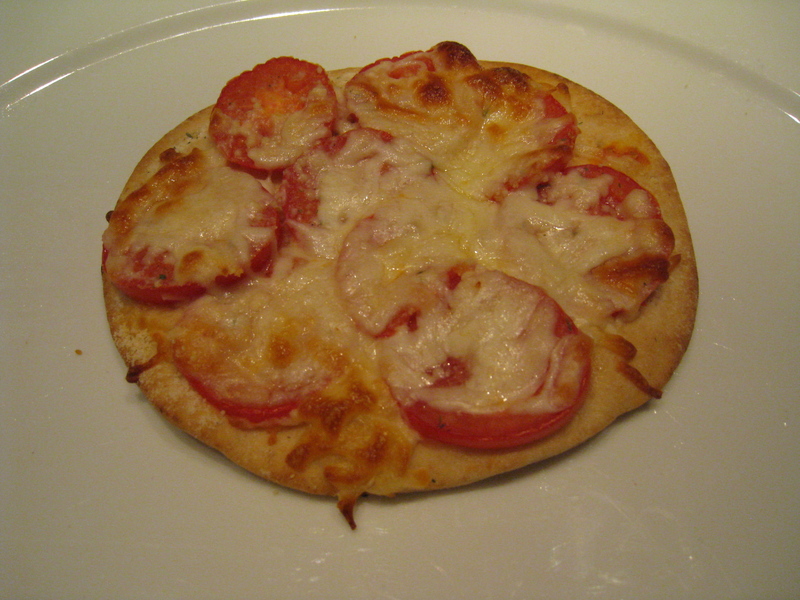 Place tomato slices on to flatbread and sprinkle garlic salt and dry ranch mix on top. Then add mozzarella and parmesean cheese on top. Place in a 400 degree oven for 10-15 minutes or until cheese is melted and has a toasted color.